73 points can be awarded to your webstore account (see FAQ). Effective at neutralizing static charges on virtually any surface without the need of sprays. The MiltyPro Zerostat 3 is highly rated for its ability to improve the sound quality of records and CDs by removing static. Available in Blue only, as pictured. The Zerostat 3 incorporates a unique Piezo Crystal device which generates a positive electrical stream of Ions with a gentle slow squeeze of the trigger, and a negative stream of ions upon slow release of the trigger thus ensuring no electrical charge on the material subjected to the zerostat stream. Constructed from a durable hard plastic, it requires no batteries or refills and is a long lasting alternative to cleaning brushes. Excellent for scientific experimentation as well. In the laboratory the Milty Pro Zerostat 3 antistatic gun keeps film, glass, plastic ware, and lenses dust and lint free. It also prevents charged particles from flying during weighting or transfer of particles. And the Zerostat gun finds wide use among those who possess and maintain phonograph record collections. We have been surprised to find that the Milty Zerostat 3 is more popular with scientific research laboratories than with LP enthusiasts! We often get orders for 3-10 devices from university and research centers around the world. Each Milty Pro Zerostat 3 antistatic gun has a 'two cycle' type of operation, when the trigger is squeezed, positive ions are generated and when the trigger is relaxed, negative ions flow. This means that it is possible to induce a charge on a neutral surface using the Zerostat. If the trigger is squeezed and the Zerostat3 is then removed from the surface (before allowing the trigger to return to its original position) a positive charge will be induced. Similarly, pointing the Zerostat3 at the surface only for the release of the trigger will induce a negative charge. Each squeeze of the trigger results in a discharge, when stated in units of charge, of about 1.5 Coulombs. One can reasonably expect on the order of 50,000 such 'squeeze cycles' during the lifetime of the gun. The Milty Zerostat 3 antistatic gun needs no batteries or electrical supply nor does it contain any radioactive components. It contains a piezoelectric device. Your slow squeezing action creates 1-4 clicks each time you squeeze and release the trigger slowly. This clicking sound is heard when the device produces the ion stream. 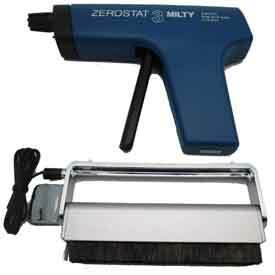 The Milty Pro Zerostat 3 antistatic gun is lightweight highly portable and easy to control and handle. Squeeze the trigger slowly. Repeated rapid squeezing may void the 90 day warranty. It is possible to shock yourself if you hold your finger on/in the barrel while squeezing the trigger so keep away from children. The plug pictured contains a neon light that will flicker when the unit makes a clicking sound as you squeeze trigger to verify operation. I resisted buying the Zerostat way back when LP was king, thinking it might be just another over-hyped, over-priced gimick. Now, years later, I decided to buy one. WOW! This thing is everything claimed. Clicks and pops either greatly reduced, or in the case of some less payed discs almost as quiet as a CD. It is well worth the price! Absolutely works on vinyl records and is an economical choice to boot. I have been using the Zero-stat in combination with a Hunt carbon fiber brush. The Zero-stat allows the brush to pick up all the dust and dirt and removes all static charge. I highly recommend this solution to getting the dust and dirt off of the record. I have owned a Zerostst gun in the 80's and have some how lost it. As this was the time CD's came into use for me my TT got very little use. Now that I have gotten back in to vinyl I miss the benefits of the Milty. I use it on every record before and some times after playing a record if highly charged.In the winter here the use of forced air central heating produces a very dry and static environment. This tool works very well at dissipating the static charge. This is my second zerostat. My first was thirty years old. It still worked but they do have a usable life span. More than once I've watched hairs and other debris jump off of my record albums when I started squeezing the trigger. If you love your vinyl, you need this tool to help clean. I bought a Zerostat back in 1982 and had been used a lot. It stopped making the click for some time and knew I needed a new anti-static gun for my albums. Ordered and got it in a few days and works like a charm. Bought this for my hubby who's an audiophile and he LOVEs it! It works great. A little pricy for a gadget but it was worth it. We use this product in the lab to discharge the static on ground rock/ore samples. In our dry season the samples, weigh dishes etc are affected by static and this product helps and is easy to use. This product works great once you figure out how to use it properly. I not only use it when I play records but have incorporated it in to my RCM cleaning regimen. Turntable Needles has the best price on this item by far. The only reason I did not give it five stars was due to the not so great build quality. Bought it for use with film. Works as anticipated, and I'm really happy to have it in my toolbox. Even better than the one I had many years ago. Happy to find one and the price wasn't bad either. I don't own records, but this anti-static tool is wonderful for getting rid of static on just about anything, from packing peanuts to a sweater. I've been using one of these since the late 70"s.If you are serious about hearing your music from that vinyl and not a lot of pops and other noise that is not pressed into that record, you should be using one Too!! They work and are worth every penny spent. Talking to others I learned this device in essentially the same form has been around for decades. I needed to neutralize static electricity to prevent dust accumulation while photographing arrangements of small objects on the recording side of optical disks in the middle of winter. It works! Have always had confidence the Zerostat would remove static from my vinyl records. We're now using it with our Large Format Digital Flatbed UV Printer. It helps remove the static from sheets of Acrylic and rolls of Pressure Sensitive Vinyl before we commit to print. Q: What is the weight of the Milty Pro Zerostat 3 LP Record Antistatic Pistol Gun Tool? Was this answer helpful? 0 of 4 Customer(s) found this Answer helpful.